Last year, when I first started Tuesday’s With Dorie, the pace of recipes being every two weeks was perfect. That was enough time for me to get in the mood to be challenged to do something new, and still cook/post a recipe or two in between. I have to admit, it has impacted my cooking. I’ve noticed the number of times that I have to read through a recipe from Baking with Julia before I “get it” has doubled and I find myself going back and forth from the counter to the book many more times – I’ve been counting that as my exercise!! 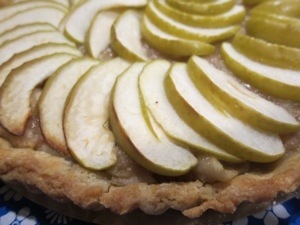 Fortunately, I found this tart to be really straightforward and I was thrilled with the results. I did, however, make the dough into what I consider to be a true tart dough, using all butter as the fat, 2tbsp of sugar, and an egg to bind it all together. I can’t help it, the little bit of sugar with the egg/butter just appeals to me more than traditional pie dough. I’m also glad I read through all the chatter before starting this time! First, for confidence that I could just use some of DH’s white bread to make the bread crumbs for the filling. And for just convincing me that I wanted to take the time and effort to make the filling at all! A little bit of work peeling apples led to a chunky (and I mean very chunky) apple filling that was awesome. The leftovers were pretty wonderful the next morning at breakfast! 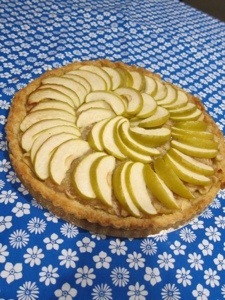 So there you have it – a pretty little apple tart! I will keep this on my short list for the fall days when I find myself with too many apples from the farm. Visit Laws of the Kitchen for the recipe and step by step instruction. There is one bonus about being 9 months preggo for the New Year – I can totally ignore all of the Resolutions around weight loss, although I suppose my efforts will start soon enough. But I did tell myself that I was going to be better about posting my TWD efforts, as I actually kept up with the baking pace this fall, but obviously never posted anything! And yet, here I am on Wednesday. I guess I could have made a resolution to be on time more. But something tells me that my ability to be on time with an upcoming newborn is not going to be high. 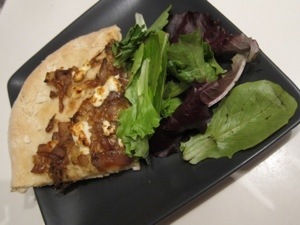 Anyhoo, I was glad to try a new pizza dough recipe, as I really overused my typical recipe this summer in an effort to use all of the CSA veggies in a manner that was palatable in my morning-sickness induced state. 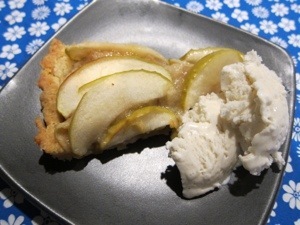 I also tried something new with this recipe – the proof feature on my oven! I’ve had this oven for a year, but it didn’t strike me to try the proofing feature until this week. This is after several attempts at keeping my kitchen warm for dough-proofing purposes by using steam from a boiling pot of water or by keeping my oven door propped. Yeah. I am happy to report that proofing worked well. 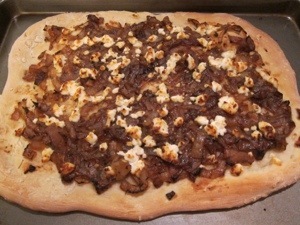 While proofing, I cooked down the onions for the confit as directed, with one change. There’s no wine in the house right now (I get pretty sad about avoiding wine these days), so the onions were cooked down with a coffee stout. I think the onions turned out beautifully in any event. I suppose I should get myself to work, eh? Hope everyone is doing well this New Year!